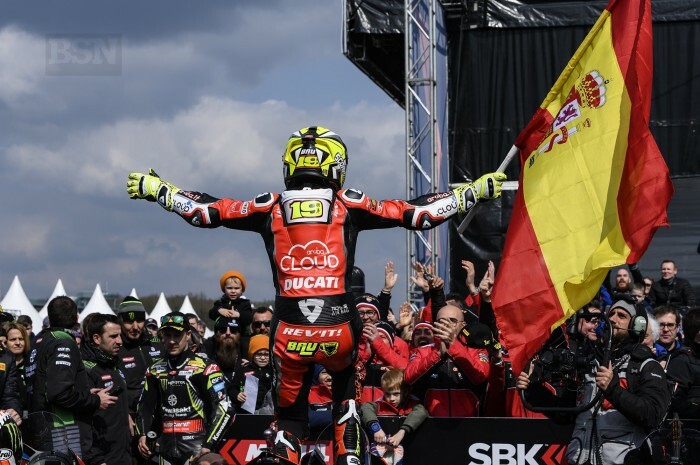 Alvaro Bautista’s WorldSBK winning record now stands at 11 starts, 11 wins. So eleven big trophies to take home after what he believes is his best race of the season so far. He joked about how many he already has, even though there were only two races at Assen, both long-range missions for full points. “Eleven wins, now I need to get a bigger safe at home,” said Bautista. “I am happy because this weekend has been more difficult for us, from Friday with a different set-up,” he stated about his up and down Assen form before raceday. “But fortunately we came back to my setting and we started to have a good feeling. Today we had to concentrate a lot and the first race was the worst. In the cold temperatures, we are struggling every time. Maybe I expected worse but the feeling with the tyres was not terrible. For the conditions I can say that the feeling was not to bad. With Jonathan Rea back in eighth and Bautista on pole he had some breathing space until Rea could get close to him. Or so he thought I race two. “In the afternoon, for sure I did not expect Jonathan in the first lap on the fourth corner. He did a really good job in the first few corners. When I was behind I wanted to see what he made, because he is very strong in this track. I wanted to see how the Kawasaki compared to my bike. But I saw that his pace was a bit slow - I think he wanted to slow down the race to have more riders in the battle. “I felt the track conditions were better than in the morning so I tried to pass him and get my pace, push to the limit and get my pace. To see what my limit is. We went faster than the lap record here and I was enjoying the bike a lot. I felt much better than in the morning. Behind me they were pushing a lot and I had to be very focused. I think this has been for me the best race of the season. I had to be very fast, very consistent and very focused. All the race.